Governor-elect Bruce Rauner and Lt. Governor-elect Evelyn Sanguinetti, chairwoman of the transition committee, announced the launch of the transition’s website: www.MakeIllinoisGreat.com. 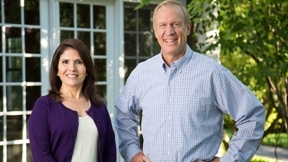 Individuals who visit the website will be able to apply to serve in the Rauner-Sanguinetti administration and can also submit their ideas to bring back Illinois. “Making Illinois the most compassionate and competitive state in America is a tremendous challenge, but it is something we can accomplish by building a talented team of individuals who want nothing more than to serve the people and by implementing the best ideas regardless of party origin,” Rauner said. “All we want is what’s best for the people of Illinois.” “Whether you are a Democrat, Republican or Independent, if you want to make Illinois more compassionate and competitive, we want to hear from you,” Sanguinetti added.